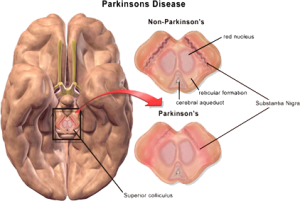 Parkinson’s disease is a chronic progressive neurological disease that affects nerve cells (neurons) in an area of the brain known as the substantia nigra. These cells normally produce dopamine, a chemical (neurotransmitter) that transmits signals between areas in the brain. These signals, when working normally, coordinate smooth and balanced muscle movement. Parkinson’s disease, however, causes neurons in the substantia nigra cells to die, leading to a lack of dopamine in the brain, especially in the part of the brain known as the basal ganglia. The basal ganglia are responsible for organizing movement commands from other parts of the brain. The loss of dopamine causes patients to lose the ability to control their body movements. Parkinson’s disease accounts for 80%of all parkinsonism with a prevelance of 360 per 100,000. There is increasing evidence that Parkinson’s disease may be inherited. Men after the age of 60 are more likely to develop the disease than women. The average age at the onset of symptoms is 60. However, 10 percent of patients are diagnosed before age 40. Diagnosing Parkinson’s disease is sometimes difficult, since early features may be difficult to assess and may mimic other disorders. For example, tremor may not be apparent as a person is sitting at rest, or posture changes may be written off as osteoporosis or simply a sign of aging. There are currently no sophisticated blood or laboratory tests available to diagnose the disease. Some imaging tests, such as CT (computed tomography) or MRI (magnetic resonance imaging) scans, may be used to rule out other disorders that cause similar symptoms. Given these circumstances, a physician may need to observe the patient over time to recognize signs of tremor and rigidity, and pair them with other characteristic symptoms. The physician will also compile a comprehensive history of the patient’s symptoms, activity, medications, other medical problems and exposures to toxic chemicals. This will likely be followed up with a rigorous physical examination with concentration on the functions of the brain and nervous system. Tests are conducted on the patient’s reflexes, coordination, muscle strength and mental function. Because the diagnosis is based on the physician’s examination of the patient, it is very important that the physician be experienced in evaluating and diagnosing patients with Parkinson’s disease. If there is any question whether or not a patient has Parkinson’s disease, the patient should see a specialist, preferably a Movement Disorders trained neurologist. The treatment decisions made early in the illness can have profound implications on the long-term success of the treatment. Common symptoms of Parkinson’s disease include tremor, or a shaking that begins on one side of the body. In some cases, this tremor is confined to only one body part, such as the hand or foot. However, it may spread as the disease progresses and it can worsen with stress. Tremor rarely disables a patient and often disappears during sleep and when the arm or leg is being moved. Most patients with Parkinson’s disease develop some degree of rigidity, or stiffness of limbs. This rigidity is caused by uncontrolled tensing of muscles and results in the patient being unable to move about freely. Also, patients may experience aches or pains from affected muscles. Balance and coordination problems are additional symptoms of advancing Parkinson’s disease. 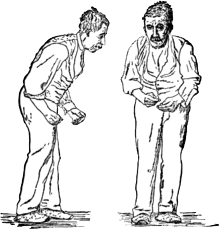 Patients typically develop a forward or backward lean that makes them more likely to fall when bumped. Additionally, a posture is often developed in which the head is bowed and shoulders are slumped (stooped posture). It is important to note that the symptoms of Parkinson’s disease can be highly variable between patients, sometimes making it hard to diagnose. In fact, as many as 25 percent are misdiagnosed. 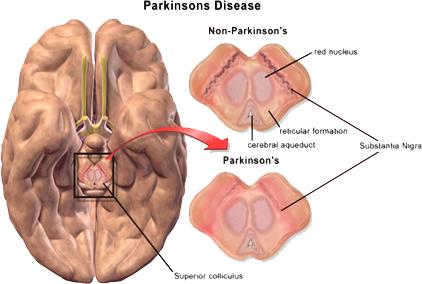 A variety of medications are available for the treatment of Parkinson’s disease symptoms. The most powerful drug for treatment of Parkinson’s symptoms is levodopa. Nerve cells can use levodopa to make dopamine, which replenishes the low amount in the brain. Levodopa is often used in combination with carbidopa to prevent or diminish some of the side effects of the medication. However, there are concerns about the long-term side effects of levodopa, especially the development of involuntary movements (dyskinesias) which can be disabling. Newer medications, such as the dopamine agonists, are much less likely to produce dyskinesias. Consequently, most experts recommend against using levodopa early in the course of the disease and to use dopamine agonists instead. If the patient cannot get sufficient relief with the dopamine agonists, particularly the newer generation of dopamine agonists, levodopa/carbidopa can be added. Dopamine agonists, such as the newer generation ropinirole and pramipexole and the older agent, bromocriptine , are agonist drugs used to treat Parkinson’s disease. These drugs mimic the role of dopamine in the brain and work by stimulating certain parts of the brain and nervous system. They can also be used in combination with levodopa, but are generally less effective in controlling rigidity and bradykinesia. Most experts will use these medications first and only add levodopa if the symptoms cannot be controlled sufficiently. Another class of drugs used to treat the symptoms of Parkinson’s disease is called COMT inhibitors because they block an enzyme that breaks down levodopa and dopamine. Examples of these are tolcapone and entacapone. Alone, the medications aren’t helpful, but they work well in combination with levodopa. Tolcapone and entacapone slow the body’s ability to get rid of levodopa, so it lasts longer and is more consistent. Because they increase the effectiveness of levodopa, tolcapone and entacapone may also increase its side effects, such as involuntary movements. Tolcapone has been associated with liver failure and is thus rarely used. When tolcapone is used, regular blood monitoring for liver damage is required. Other medications include amantadine, selegiline , and rasagiline . These drugs can be used in early Parkinson’s disease on their own or can be combined with levodopa later in the course of the illness. There are now a number of safe and effective surgical options available for the treatment of Parkinson’s disease. Generally, surgery is only considered when medication cannot provide adequate control. 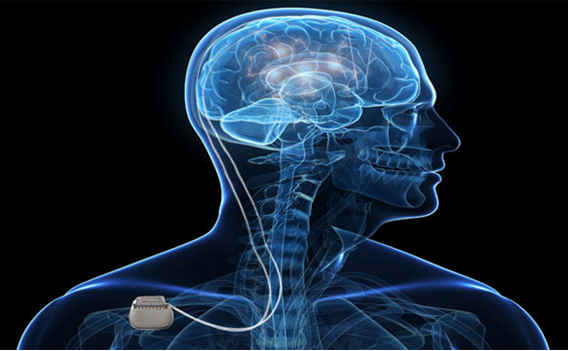 Deep brain stimulation involves placing an electrode permanently in one of three locations deep in the brain. The electrode is then connected to a type of pacemaker implanted under the skin on the chest. Once activated, the device sends continuous electrical pulses to the targets, blocking the impulses that cause tremors. Deep brain stimulation has many significant advantages. First, it does not require purposeful destruction of any part of the brain and therefore, has few complications. Deep brain stimulation is adjustable and can be changed as the patient’s disease or response to medications change. If deep brain stimulation is causing excessive side effects, the stimulator can be turned off and the effects reverse, which is not the case with older destructive surgeries. Older surgeries required the purposeful destruction of parts of the brain and had a higher risk of complications. They are rarely done today. In pallidotomy, a small section of the brain that is overactive due to Parkinson’s disease is permanently destroyed using surgical techniques. This treatment can eliminate rigidity and significantly reduce tremor, bradykinesia, and balance problems. Thalamotomy is a similar procedure where a section of the thalamus, the part of the brain that controls messaging, is destroyed using surgical techniques. This treatment is used only to control tremors and is not generally recommended because of better targets. Most of these “clinical trials” allow the Parkinson patient to continue with their usual medications while participating in the study. During clinic visits, patients and their caregivers should ask their health care provider if some of these clinical trials are available and an option. Participating may improve their own care while contributing to the advancement of Parkinson’s disease treatment. Although research is ongoing, to date there is no known cure or preventative measure for Parkinson’s disease. It is important to realize that the patient’s and physician’s efforts should be focused on management of the disease. Through identifying individual symptoms and determining a proper course of action, most people with Parkinson’s disease can live enjoyable, fulfilling lives. The good news is that physicians have a much clearer profile of the condition, and are closer than ever to finding a cause—which may help find a cure.